The article below was written by Richard Doughty (Freelance Journalist and ex-Guardian Newspaper). Blink and you’d miss it. In a narrow country lane, a rough track led through a gap in the hedge to an overgrown piece of woodland with a shack in the middle – and a secret. Hidden under wooden cladding and a blockwork extension was an ancient railway carriage, bought in the 1920s as a cheap way of housing farm labourers. It was in Dawes Lane, Sarratt, Hertfordshire, a tightly green-belted village in south-west Hertfordshire and on a plot suddenly up for sale. That was in 2008, just after the crash, when few people were looking for property, let alone planning a new build. 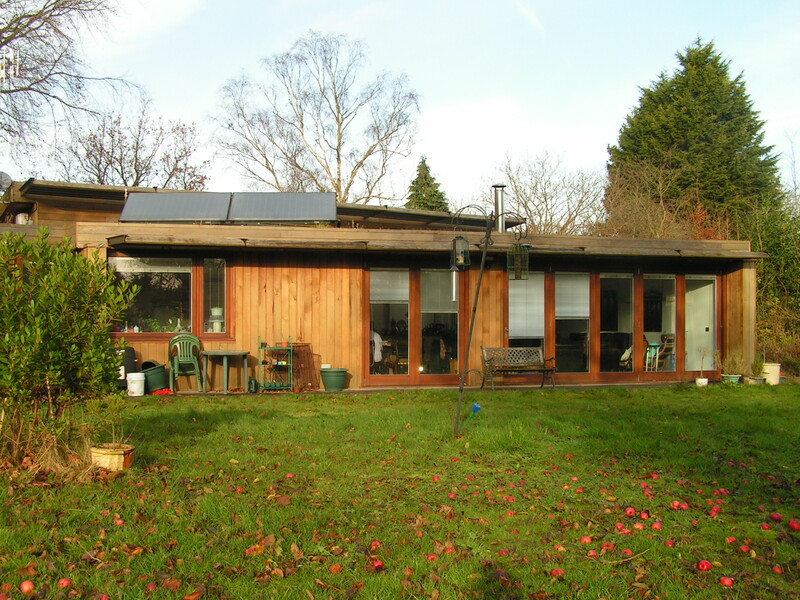 But for software engineer Lee Farman and his wife Catherine, who had long dreamt of owning their own ecohouse, it was perfect timing. Lee’s business was booming, the property market was weak and they were able to snap up the plot 17% below asking price. “The structure was brilliant but so quirky,” said Lee. “You could see the rooms had the curved roof of a train carriage and there was a step up to a carriage door.” At least six people had all been living in it at one stage before they sold to the previous owner. However, buying the plot was one thing; building on it quite another. It had outline planning permission but this was just for a “white, square box” with strict limits attached. Planning rules in Sarratt, an area of outstanding natural beauty, state no new structure can be higher than the existing building – in this case a train carriage just over 3m high – “and so not enough for a two-storey building,” said Lee. The biggest challenge was to convincthe local planning officer of the new owner’s genuine green credentials and a design that worked for all parties. Otherwise the eco-home would not happen. So began the tricky design process set in motion by local architect Chris Gregory of TEC Architecture, a Hertfordshire-based practice in Croxley Green, near Watford. “The site was so overgrown, it was a struggle to decipher the plot at first,” said Chris. “It was like ¾ acre of abandoned woodland and then some. It was difficult to see how it related to the adjacent properties. So I designed in 3D in the abstract and worked around the protected trees, once we had cleared out a lot of the real rubbish. Chris and Lee came up with a novel, timber-clad, two-storey design half in and half out of the ground. It met planning height restrictions and used up almost every inch of the previous building’s L-shaped footprint. 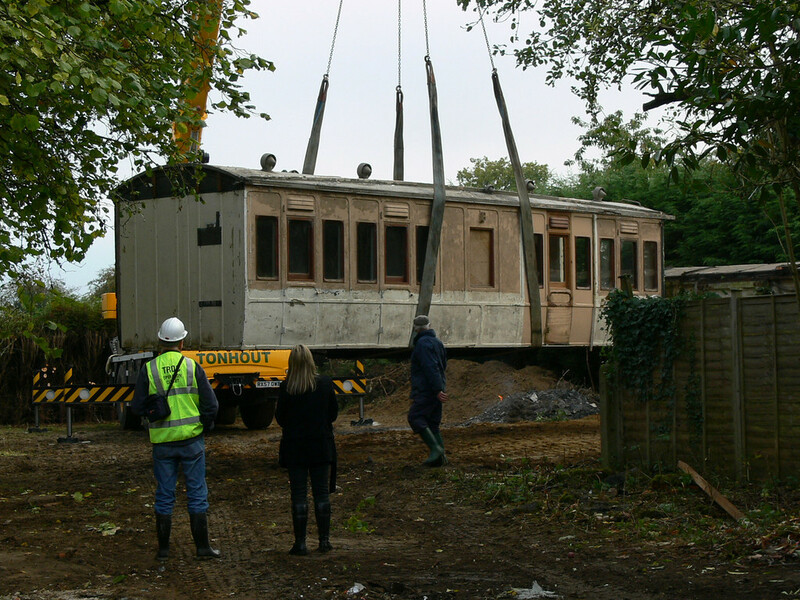 Planning had been the first hurdle; the second was finding the railway carriage a good home. Preserved under cladding for decades, it was a Pullman carriage used on the old London and North-Western railway – a true collector’s piece built in the late 1880s. It had been “spotted” a few years earlier by an enthusiast linked to Quainton Railway Society, near Aylesbury, Bucks, and he approached the Farmans. “We checked him out and then said he could have it,” said Lee. With the site clear, space, light and insulation were the priorities and from the start everything was about reducing the carbon footprint. The volume of excavated earth is around three times its size in a compact state and to minimise traffic most earth was returned and spread over the back garden to produce a slope. In the design itself natural light was key. Restricted by height, Chris designed a half basement which could still receive natural light and avoid the high cost of digging out a full basement. So imagine one side of the house with a semi-submerged ground floor, games room, utilities, spare bedroom and office; and a first floor of three bedrooms and a bathroom. The other side was at ground level, comprising living, kitchen and utility rooms. Everything was done to cut heating bills. A ground source heat pump drew on natural ground heat which heated water in pipes laid underground; these then created underfloor heating. The proof of the airtight insulation, checked out with extensive smoke tests, is in Lee’s calculation that on a cold day he only needs 4 kilowatts to heat up the whole house. Forget plasterboard. A high-density material called Fermacel made up the main linings for ceilings and walls; like stone buildings, it absorbs heat during the day, releasing it at night. 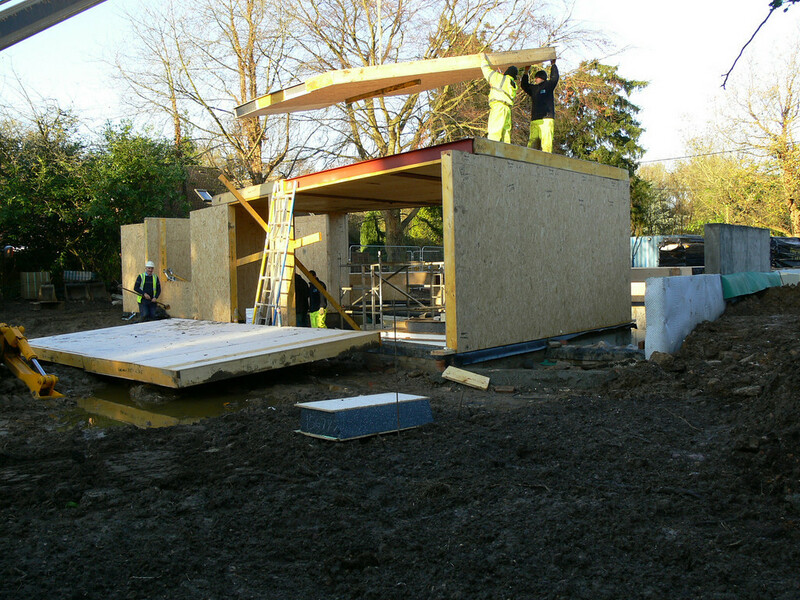 External walls were covered with covered wood cladding sourced from sustainable forests and, once foundations were laid, a team of specialist builders put up the structural insulated panels (SIPs) in just 10 days. Fixed angle shades over the rooflights cut down high-level sun in summer but in winter allowed for useful solar gain from low level sun that shines in below the shades. The many additional green features included toilets using rainwater, adjustable blinds built inside double-glazed floor-to-ceiling windows in the living room, and 14 photovoltaic solar cells in the roof which carried special natural foliage insulation you can safely stand on to carry out occasional maintenance. The roofs of the ground floor section and an outhouse were covered with a carpet of alpine flowering plants called sedum, woven into a synthetic mat. Aside from helping reduce the building’s carbon footprint, the sedum cover prevents water run-off and drainage problems.